What does it mean to be One Nation Under God? Are the words merely a political slogan or do they have value when a nation constructions its social polices? 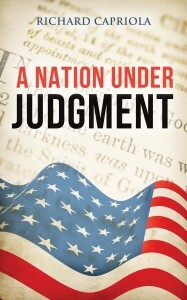 A Nation Under Judgment reviews our country’s social policies from a Scriptural point of view and empowers readers to determine if our nation is moving away from being One Nation Under God. I began with the intent to write a book about wisdom. In doing so I had to find a good definition for wisdom. The one that I found was “wisdom is the ability to see things from God’s point of view.” With this definition I began to ask the question “have we lost our wisdom as a nation?” This led me to begin reviewing our nation’s social polices from a Scriptural point of view (i.e. God’s point of view) and that led to the creation of A Nation Under Judgment. Richard Capriola has been a hospital chaplain and led an outreach ministry for a local Midwestern church. He completed four years of Clinical Pastoral Education in preparation for this chaplaincy work. He continues to work in the field of mental health as a counselor.